I have AIDS. No, not THAT AIDS! I have Ambition Imbalance and Deficiency Syndrome. Sometimes I get a little overambitious, and other times I can’t muster enough ambition to even think about starting something. Often my ambition is killed off during the process of planning and anticipating an event. For example, over two months ago I posted that we had some exciting things planned – and we did. And we did them. However, when it came time to do my favorite part – write about those events – my ambition was dead. I had planned on writing, I had anticipated writing, but when it came time to do it, I lacked the ambition to actually write about all the cool things we did. So now, two months later, I’ll be scraping the bottom of my rusty memory bucket to attempt a portrayal of our exciting activities without leaving out the most important ingredient – the fun. The first activity we had planned was the construction and use of a compressed air rocket launching system. The details of the build and our adventures launching the rockets can be found at my other blog in two parts. The first part details the building of the system and presents a few problems with it. The second part has some video of our launches, and includes solutions to most of the problems we encountered. The cool thing about this system is that everything is reusable (no burning engines to replace for each flight) and the rockets can be made from common papers and things you have in your home already. Going out to launch rockets is a good excuse for a picnic. In all, we uploaded five videos of the rocket launches ranging in length from ten seconds to a minute and a half each, plus two compilations – one lasting over two and a half minutes, the other being only forty five seconds. I suppose I could edit them into a single video for you, but I completely lack the ambition. So, instead I will take the time to list and link to each of them here. Note that the first round of rocket launches were unsuccessful due to the rockets exploding. These launches were still fun though. In addition to launching paper rockets, we took the kids camping finally. More about that under each child’s section. The rest of the time since August has been spent doing nothing. Not really, but that sure simplifies the process of writing this post for you. I’d get input from Rochelle on what she wants to include in here, but it’s three thirty in the morning and I doubt she’d enjoy me waking her to ask what I should write about. If I don’t do this now, it won’t get done until next month. Oh, and I’m not staying up late for fun – I’m on a night shift schedule this month. Hopefully, this should be the last round of night shifts for about nine months. I’m not holding my breath though. Nothing. Still trying to tackle the ever growing pile of magazines that I subscribe to. My RAI (reading ambition index) is at a zero lately. I did manage to model a more modest dream home than the one I featured last time. Maybe I’ll make a video of this new one for next months post. Maybe I won’t. Maybe I’ll actually start reading a book soon. There are so many that I want to read. Rochelle has read or reread hundreds, maybe trillions of books since I last wrote, so we’ll leave this blank until next month when I will actually consult with her on what to put here. Micah has been struggling to come to terms with the fact that nearly everything Sophie does to annoy him she learned from him. I’m hoping he’s learning lessons that he’ll actually take and use from all of this. Really though, he had fun. He especially had fun when… well, I’ll get to that in a minute. It has more to do with Sophie than Micah. Sophie also had a good time launching the rockets, and she was the one who insisted we take that cute picture of her and Rochelle above. On the camping trip she was especially good and very cute (took lots of video – see the links below). She especially enjoyed trips to the camp restroom. We did have one minor incident on the trip though – Sophie burnt her hand while roasting hot dogs for dinner. Funny story actually, she was really excited to eat the hot dog, and before we could properly instruct her on how to remove and eat the hot dog, she grabbed for it. The hot dog wasn’t what burned her though, it was the metal stick it had been cooking on. We had warned her that it would be hot, but she’s only two and these things are easy to forget. Actually, while she was still cooking the hot dog I decided to pull out my camera and take some video since everyone was doing such a good job and following directions so well. Just as I hit the record button, Sophie decided she couldn’t wait to eat any longer, and I got video of the whole thing. It’s the saddest camping video I’ve ever recorded. Of course, when she dropped her stick it landed on Micah’s arm. While he tried to play it up for a bit of a bigger deal than it was, his burn was minor compared to Sophie’s. He looked like he got a light sunburn through a hole in a long sleeved shirt. Sophie’s burn, though, was a pretty serious light burn. It wasn’t anything we had to go to the hospital for, but it hurt bad and took nearly a week to fully heal. After a little while she recognized it for the cool battle scar that it was. She had a great time climbing around and talking about Toy Story. Finally, make sure you check out all of the new photos on this year’s family web album. Obviously, that’s not everything we’ve done for the last two months, but it’s more than enough update for you, I’m sure. 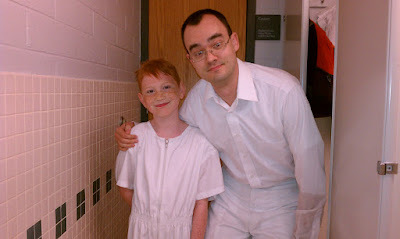 If you’ve been counting months, you know that we should have taken Sophie in for an MRI recently. It didn’t happen yet, but we’re scheduling it this week (the referrals were just approved at the end of last week). As soon as we know what the results are, we’ll post something on this blog (just a quick update). I can’t shake the feeling that there are big, fun things I’ve left out. Such is the nature of really, really late blog posting. I’ll be sure to post something next month. Thank you for all of your love and support. We love all of you, our dear family, friends and random Internet citizens. I’m going to bed right now. That’s been the story for the last several weeks. My deepest apologies for not posting in the middle of September, but you’ll have two great posts within the next two-and-a-half weeks to make up for it. Wow, where did the last week go? On the 13th I remember thinking, “I’m going to write up that post for the family site,” and it didn’t happen. Then one thing led to another thing and here I am posting five days later than I ever wanted to. While not an official rule, I always hope to have something posted for you by the 15th of every month. So, here is an underwhelming and unforgivably late collection of goings on from the Haddad family. Yes, we’ve engaged in various activities of varying levels of excitement, but we have, on every single occasion, neglected to bring out the camera and record anything for you to see. I know, we’ve failed you, and I also know you don’t really care. It seems you can’t make up your mind. I understand your frustration, even if it is only the frustration that I feel, superimposed unwittingly upon you in the wildly distorted version of the world that lives safely confined to my head. For any of you who are still wondering, I am no longer working the night shift. This is a good thing. As of a few weeks ago, I am working days again. There has been much rejoicing. Micah’s final day of school was last Wednesday, Sophie’s 6 month MRI was a couple of weeks before Micah’s last day of school, and the local pool is open so Rochelle and the kids have been visiting it with much frequency. So, with more details on all of that, let’s get into the individual sections. I haven’t read any books in so long, it’s starting to eat at me. How can I call myself an intelligent person if I can’t even make time to read? I’ll get there, I promise myself. I was doing so well for a while, then everything fell apart. When I finally pick a book back up with the intention of finishing it, I’ll let you know. She recently reread Anne of Green Gables, Anne of Avonlea, and Anne of the Island, which she just finished today. I remember we purchased the entire set of Anne books a while back, and, though I haven’t been counting, I’m pretty sure she’s read every book in the series at least fifty times since we bought the set two years ago. She really loves those books. Tonight, before going to sleep, she will have to read, which means she’ll be picking out a new book. This usually involves several long moments of agony, in which she wishes she could simultaneously read several books that she wants to read equally, all while longing that her book collection were vastly larger. She’ll stand for what feels like hours in front of the bookshelf, staring at its contents, and if she can’t find anything there she’ll turn on her Nook and browse through the many books she’s downloaded onto the device, or peruse through the online selection, carefully pondering what she might purchase with her monthly book budget. In the end, if she isn’t feeling terribly adventurous, she’ll make her choice from among a very narrow set of books that she loves because she’s read them a hundred times or more. Never mind, she’s not done with the Anne series. She’s on Anne of Windy Poplars. She’s reading it right now, as I type. I haven’t taken any photos of Micah recently, and I would go in and take one of him sleeping right now if it weren’t for two potential problems. First, he’s been staying up incredibly late these days. So, I don’t want to barge in there with my flash blazing if he is still awake or just falling asleep. Secondly, he has been very hot in his room, so he hasn’t been covering himself very modestly. Sure, he’s got underwear on, but you don’t need to see it. And if he’s asleep, and I take a photo of him, you’ll probably wind up seeing some tighty whities. I’ll get photos of him up for next month. Promise. Now, his self written content. For next month, I’m going to try to get him to write a little bit more. Also, I didn’t get a chance to go over this with him before writing up this post, so I’m just leaving all the errors in there (though I’m changing the letters that look like other letters to reflect the intended letters). Almost everyday my family goes to the pool. We just went to the shallow part and of coarse, we went to the deep end. (1) Then at school, we had a picnic. And we had the last day of school with a pizza party. And we had feild day. (2) Have a great sumer folks! Just to shine a little light on why this is significant to him – he’s developed a borderline phobia of deep water. I remember him carelessly splashing around in deep water with those floaty things on just a couple of years ago, but something happened since then. Now, when we take him into deeper water, he literally freaks out – getting very tense, clinging on to anything he can as though letting go will mean instant death, and he becomes incapable of reasoning. This is often accompanied by sobbing and screaming bloody murder. Last time we went to the pool together, just yesterday, I worked with him for over an hour (at my own expense, since I was the only one not wearing sunscreen) and got him to calm down enough to be able to reason with him a bit. Though he remained very nervous, I managed to get him out to the deep end without him clinging violently to me, and once he stopped screaming hysterically, he even called out to his mother to show her how brave he was being. However, I had to keep at least one hand firmly gripping him at all times, preferably two. Every time I changed my hand configuration I explained very clearly what I was going to do in a calm, loving voice, I went over how I was going to do it several times, and I made sure he was ok with it. Then, when I actually executed the change, he lost it and it took many minutes to get him to stop screaming. Hopefully, if I can work with him with any regularity, we can prevent him from developing a real phobia that carries over to adulthood. I certainly identify with his feelings though, because, as many of you know, I am currently dealing with a phobia of needles that I developed as a child. The picnic, pizza party and field day didn’t happen in that order. I didn’t get all the details on the field day, but I think it was just a big outdoor sporting extravaganza at the school. It wasn’t a field trip (which, to me, would have been much more exciting). Now that I think about it, I think they had their field day, then the picnic, then the pizza party. Not that it matters, of course. Like I said, I want Micah to write a little more for next month, so if you have any inspiring questions for him to write about, ask away in the comments. He may complain about having to write more, but he loves the attention, and he doesn’t have any school work to worry about, so it’s no big deal, right? First off, Sophie had her six month MRI on Wednesday, the second day of June. She went down fine for the scan, but woke up afterward a little early due to a coughing fit. She had been somewhat congested, which was a concern with putting her under for the scan, but the doctors decided it was safe. She was safe, but the mucous had collected a bit in her throat, causing her body to want to eject it, inducing a coughing fit. She was still very groggy, and we had to endure a very cranky little girl for over an hour before she was able to show the nurses that she could keep fluids down and they let us go home. The following Friday, I called to see what her scans looked like. They looked great. Thank goodness. Other than that, she’s been very healthy and very happy. She enjoys going to the pool, and she has become a lot more vocal and expressive over the last month or so. 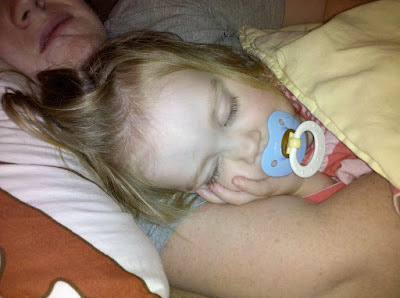 Most recently, she has decided that she doesn’t want to go to bed on time. This is fine with us, as long as she plays quietly in her room. We put the gate up, sealing her inside, and for the first few days she would stand at the gate and cry for a few minutes until deciding that we weren’t coming. At that point, she would go play with toys. She would often take one particular toy that makes music into her bed with her and fall asleep listening to it. She’s very sweet. The last couple of nights have been different though, with her deciding that she’d rather scream and cry than play and get in bed. Tonight I stood outside her door for several minutes listening to her cry like a mad woman before she started pitifully calling out, “Guys, come here right now. I’m crying. Pweeeeeeese.” Her voice was sobbing and whiny. It was really cute to me. Eventually, these calls turned into, “I need help. Please, I need help!” It’s quite entertaining. With it being Father’s Day and all, I decided to go in and comfort her for a minute. I held her, walked around her room for a minute, then sat by her bed until she fell asleep (which didn’t take long at all because she was really tired). That’s when I snapped the photo above. 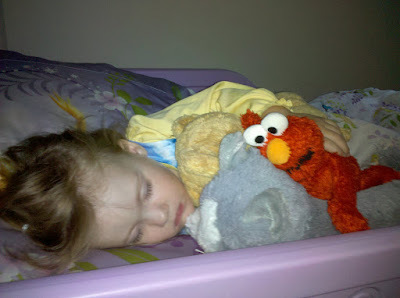 She always goes to sleep with her bear, her cat, and her Elmo doll. She is a very sweet little girl. The other day we got some Summer entertainment equipment. The adults got roller blades and the kids got skates. We all have or purchased helmets too. Sophie’s skates are the type that snap on over the shoes. She loves looking at them and wearing them (they have Tinkerbell all over them), but not skating in them. She enjoys watching us skate, but she gets very nervous when we put her down on the ground with them on. I figure she’ll feel more confident after watching us get better at it for a while. I remember being very good at roller blading at one time, but now every time I strap them on I feel like I’m going to fall on my rump the whole time. It’s frightening. 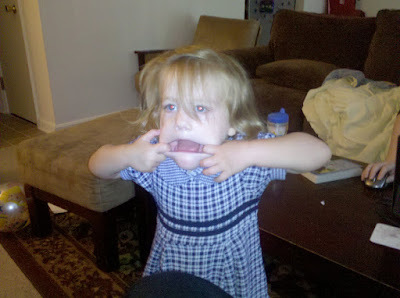 Oh yeah, the only new video I’ve posted recently is of Sophie making silly faces. It’s fun, but it was taken on Rochelle’s old camera phone, so the quality isn’t great. Next time we go skating I’ll have to take some photos and video. And I’ll try to capture us doing other interesting things as well. No promises though, we’re still very busy with other life stuff. I know you don’t mind the post being late, but I am striving to post regularly enough that you can always come around the middle of the month and see the latest news. This month, I apologize for posting late, and I will do better next month. Rochelle is taking the kids to see her family in Mississippi this next week, so we should have news and pictures from that trip to post next month. I would love to join them on the trip, but there is no way I can take any time off work right now. Plus, even if I could get away, it’s better for me to save the time off for later in the year when the holidays start coming. We love all of you, and want to wish every father in our family a happy Father’s Day today (even though most of you are probably reading this after Father’s Day).